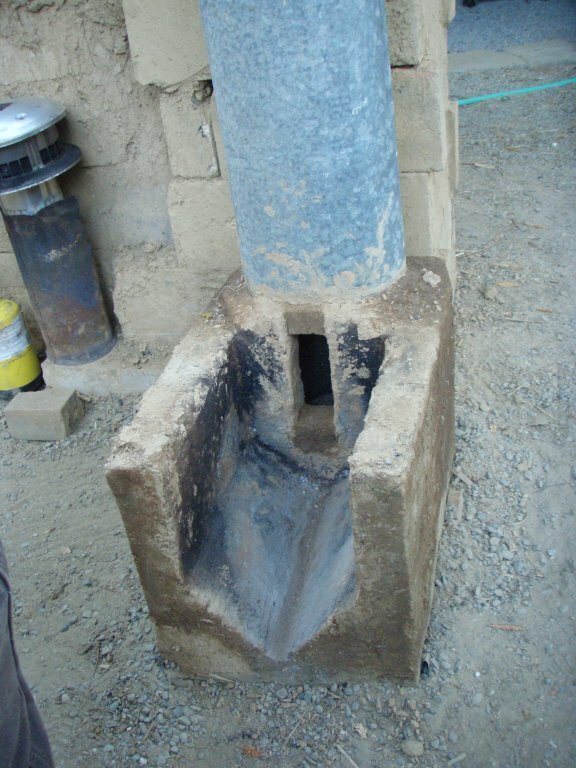 A Mud Batch-Box | Rocket Stoves.. Experimenters corner.. Answers questioned! My friend (and co-worker), Bryan Burnoski and I have been fooling around quite a lot this last month. 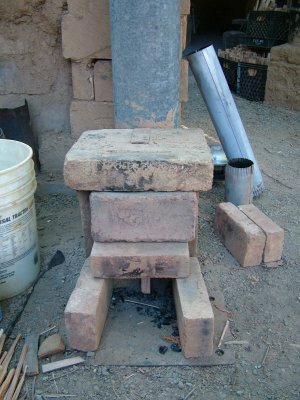 Building different configurations of rocket stove, testing them, etc. One of our experiments was to see if we could build a Peterberg style batch-box out of a cob-like mixture. What we did was to make a template out of a piece of scrap plywood the shape of the inside opening and throat (port) of the batch-box. We built a box to hold the wet mix out of cardboard and filled it with our mix, using the template to shape the inside (v-bottom and all). We used a short, cut-off piece of stovepipe as an internal form for the bottom of the heat riser and carved the throat (port) with a putty knife. Here's the template and the base with the heat-riser outer jacket in place. It's a 4 inch system. 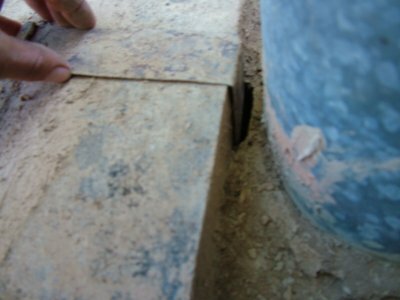 We used old chimney pipe for the heat riser and packed between them with saw-dust/clay slip for insulation. We used a couple of extra-large bricks that I have laying about as a top and a few regular bricks to arrange a "door" covering. Our first run was quite smoky. The thing was still soaking wet and it took quite a while before it was dry enough to run "right". Even so, it seemed to never quite do it. Careful measurement and re-looking into the batch-box threads gave me the idea that our throat (port) was too large. We reduced the throat and ran the stove again. This time, after a smoky start (had to dry out again), we experienced thermal run-away. The stove made VERY aggressive noises and spit flame. 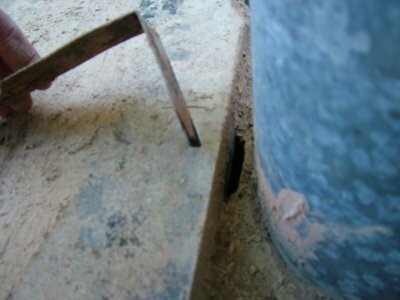 We had a short piece of stove pipe with a spark-arrestor attached to the heat riser to keep fire danger low. The spark arrestor turned red and had flames blasting out of it, we were concerned that it would melt away, which it began to do. Fortunately, the stove burned through it's fuel load just in time. I'll post more pictures after a while. Oh man, good times! Mud stoves are just way too much fun. It do surprise me the stove is able to sound very aggressively. After all, it's just a mere 4" system. It looks like you've made the port higher up, is the floor of the riser level with the threshold or is it lower? And is there a back sweep behind the port? Dimensions of a four-incher according to my experimental model and the accepted scale method: base dimension is 2.89", fire box width x heigth x depth = 5.79' x 8.68" x 11.58" give or take some. The port is height x width = 6.37" x 1.45". 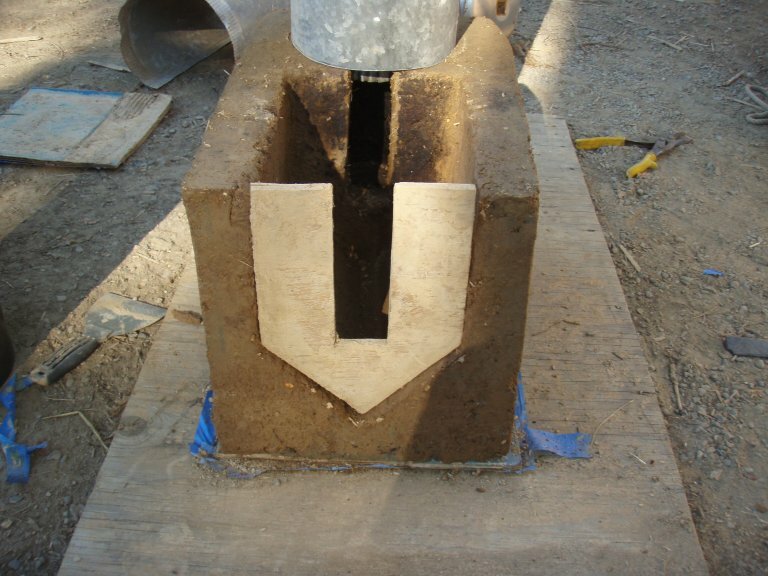 Main inlet 2.51 sq. in., p-channel 0.63 sq. in., p's dimensions 1.45" x 0.43" or thereabouts. I've rounded off the figures already. Is this correct? You know, I'm very curious what the deviations are as compared to my model. Apparently, this undersized dwarf is a very capable stove in its league. The floor of the riser is lower than the port and there is no sweep at the back of it. The port is a little wider, 1.75 in. so it had to be shorter, at a about 5.16 inches. We figured out the dimensions of the stove body a little differently, kind of a fresh start there. We started with the 4X CSA figure, decided that the V-bottom should be about 1/4 of the full opening (CSA), figured that volume, then the remainer for the vertical top part. Measuring the width (I've got our template here at the table, so I'm measuring the actual thing rather than the theoretical thing) I get 7.26 inches, it is 6.5 inches from the top of the box to the "shoulders" at the top of the V and the V is 3.5 inches tall. The box minus the V section is (7.26*6.5) 47.19" sq. The V is 5" at each "leg", (5*5/2) 12.5" sq. The firebox CSA (according to the template) is 59.69" square. 4X CSA of a 4" pipe should be 50.24". It looks like we slopped a bit, I wouldn't be surprised if there is even MORE slop in the actual firebox itself. The cob mixture does slump and move a little when it dries. The depth of this firebox is (gotta run out and measure, back in a moment) ROUGHLY 10.5". I say ROUGHLY because it appears that neither the back nor the opening is quite square. The measurement varies from between 10.75 and 10.5. We were aiming for an 11.5" box, we apparently lost an inch in slump and slop. It may be possible to carve the back flat and to the proper depth. The P-channel is about the same width as the port (1.75") and it's opening is (oops, off to measure it and back again) roughly .32" deep, so the P-channel is roughly .56" sq. Again - roughly because the thing is made by hand with a trowel and putty-knife. The opening is slightly deeper than that, but the piece of sheet metal (chunk off of a barrel) that we used to create the down-hanging part has thickness and takes up some space. It may be that my measurement is not entirely accurate, but it looks like the P-channel can be a little bit deeper. 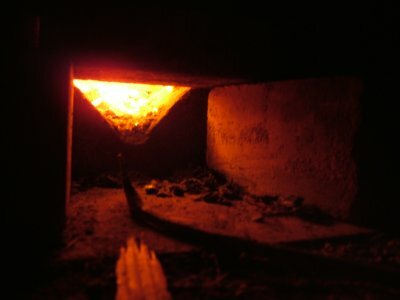 I will take some images of the stove in it's current condition, some details of the P-channel, etc. and post them a little bit later. In the mean time, how about a little fire?? Last night, Leslie Jackson came to visit. We ran the stove over dinner and it went into thermal over-run again. Everyone was suitably impressed. 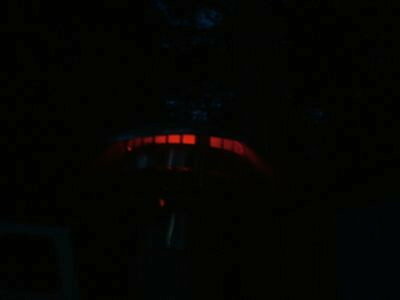 This last one is a bit hard to see, I've adjusted the images brightness curves slightly to make the flame tongues that are coming out of our chimney topper more visible. By the time I got the camera going, the fire had died down quite a bit, so this isn't quite at the top of it's game here but just down-hill running down the back-side. So far, I really like this stove. It needs some more work to make it everything it can be, or at least to make it conform to the numbers. I'm a bit surprised at how good this little thing runs, in spite of the fact that there is some goof factor in it's construction. Now to be fair, there isn't a bell, barrel or bench-run attached to this thing yet. It's basically running open to the sky. It may be that it fails when attached to a heat harvesting arrangement.. We will see. Very nice fellas...nice job. How's the cob holding up so far and what is its make up? I'm particularly interested in this "baby" because my first prototype may be a little 3.5incher, purely because of materials on hand right now. We first made a mixture of wood-ash/clay. The clay was taken from the ground around here, whipped in a barrel with water and a paddle mixer till a little thicker than "milkshake" consistency, finally screened through an 1/8 inch screen to get rocks and roots out. This clay slip was then mixed with enough wood-ash to form a thick bread dough like mix. We wet the mix with a little water and added rice hulls and chopped rice straw which improves workability, reduces cracking and lightens the mix, making it a little more insualtive. We discovered that we had not made enough mix to do the whole job, so we used some extra cob leftover from a different job (dried on the tarp). This cob was what I would classify as "sand heavy" (for everyday building cob) and "straw poor". We re-wet this cob and added some of this to the ash/clay dough. So far, only 3 or 4 burns in, it's holding up very well. The inside of the firebox is slightly bisqued (turning into fired brick) in a few places. I really can't say how well it will stand up to the abuse of REAL use. This is just a test model, meant to just see IF we could do it and have some fun over a few beers. I plan to keep it in the yard and play with it for a little while longer. It will likely get some more carving here and there, maybe some additions (like a swept heat riser back). I'll keep y'all in the loop as things progress. The stove with it's "door" on. Door height (primary air) is more or less a complete guess. We know that the V portion of the box is 1/4 of firebox CSA, so 20% (primary air intake) should be a little smaller than the V.. As usual, my tactic is to guess close, slap it on and adjust till things work. 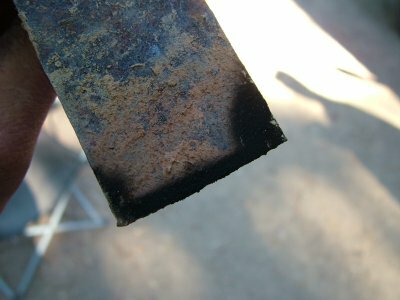 When I took out the plate for inspection, I noticed this blackening pattern on it. There is (very clearly) some leakage around the plate edges, more so on one side (left side of the stove) than the other. I really like this. Any more photos or observations? Something that I missed when building this stove is that when you make the port, you make it low down, like your original "siphon" system. The port in this mud batch is at the top. I haven't used this stove in a little while, but I remember feeling that in spite of the apparent thermal overrun, it's not quite there yet. I'm not sure whether it is important or not. One thing though, this burner yields its highest efficiency when the fuel is level with the ceiling of the port or higher. As a consequence, you have to load your stove right up to the top to achieve the same effect. 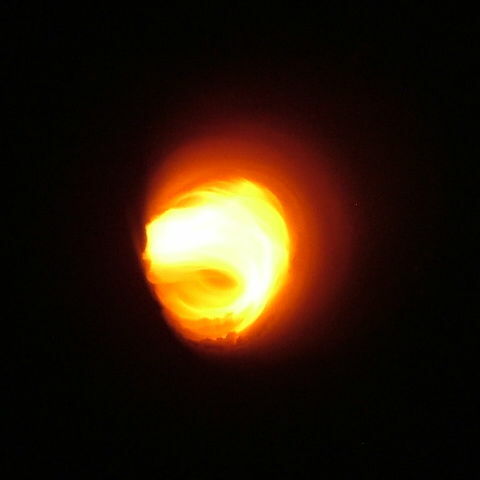 Just a thought: when the flame start to burn through the port it's definitely better to have it as low as possible. The top down burn method happend to be not as good as the little-fire-and-add-to-it method. The back sweep inside the riser will add to an already complicated pattern of turbulence. Question: when in thermal runaway, did it show a pulse like a high speed steam locomotive? The back sweep inside the riser will add to an already complicated pattern of turbulence. Umm.. Is this GOOD?? If so, I can (once slot height is finally established) bring the riser bottom level with the bottom of the slot AND sweep the back. No. I did NOT see this effect. I plan to fire the stove some time this evening, will push it as far as possible and report back. So, theoretically the lower the slot, the better. I've read here that the tall(ish), narrow slot is better than a short, wide slot. Is there a height/width ratio that seems to work best (that you know of)? Yes, I've tried 7 or 8 sizes and the last one seems to do best. Height/width ratio is 4 to 1. Actually, the height is 2.2 times and width is 0.5 times base size. The overhang of the p-channel will reduce that to almost a 2 /0.5 ratio. The port like this will be very close to 68.5% of system size. I plan to fire the stove some time this evening, will push it as far as possible and report back. Damn.. Too windy tonight. Fire danger is just too high. Actually, the height is 2.2 times and width is 0.5 times base size. This checks out with the batch-box .XL file. Ermm.. the only issue with lowering the throat is that a simple plate for the p-channel will not do. I'll have to figure something else out. As always with me, this stove is a space-age technology made from (practically)stone-age materials and methods. It's gonna take a little thought to find a method that is primitive enough to suit my tastes.